In a country where it’s common to find apples from South Africa, potatoes from India and carrots from Australia — all marked at a price to cover the import costs — in supermarkets, some farming initiatives in recent years are bringing to reality a new breed of green agriculture that seeks to produce more crops in less space and water, and is efficient, easier and kinder on the natural environment. It is hard not to be dazzled by the current pace of technological change in agriculture in the country. An ambitious manifestation of agricultural technology is coming to fruition next year. Emirates Flight Catering and US-based Crop One Holdings are building what they say will be the world’s largest vertical farm, producing 2,700kg of pesticide-free leafy greens daily, in Dubai. The greens will be manufactured using hydroponics, a technique in which crops are grown in vertical stacks of plant beds, without soil, sunlight or pesticides. Above each bed of greens will be columns of LED lights, which when plants photosynthesise will convert light of certain wavelengths into chemical energy and store it for future use. Proponents of new-age farming tout the potential of such technology to address the country’s largely hostile desert landscapes, its reliance on the global food trade, importing more than 80 per cent of its food needs, and food shortages as the population continues to grow. Developing sustainable farming with smart use of water will not only provide improved supplies for the local market but also potentially create viable businesses for export to neighbouring countries. For Omar Al Jundi, Founder and CEO of Badia Farms, the Middle East’s first commercial vertical farm in Dubai, sustainable farming is a solution for more pressing and concrete concerns such as land — less than 5 per cent of the total land area being arable in the UAE — and water shortages, meeting the demand for locally grown greens, and climate change. Growing and selling locally means emissions associated with transportation are reduced. Sustainable farming is the future. It is time for the country and the region to become food producers rather than just consumers. Using hydroponics technology on an 800-square-metre plot of land in Dubai, Badia Farms grows gourmet leafy greens for sale 365 days of the year. Situated halfway between Dubai and Abu Dhabi, EHF has adapted modern technology to grow lettuce and other herb crops year-round as well. The produce, which it sells both online and offline, is not only cheaper than imported goods but fresher too, adds Omar. Hydroponics uses 90 per cent less water than traditional open-field farming. Meanwhile, to grow tomatoes, Abu Dhabi-based Pure Harvest Smart is using a fully climate-controlled high-tech, water-efficient greenhouse, which is yielding ten times more food per metre using one-seventh the water. 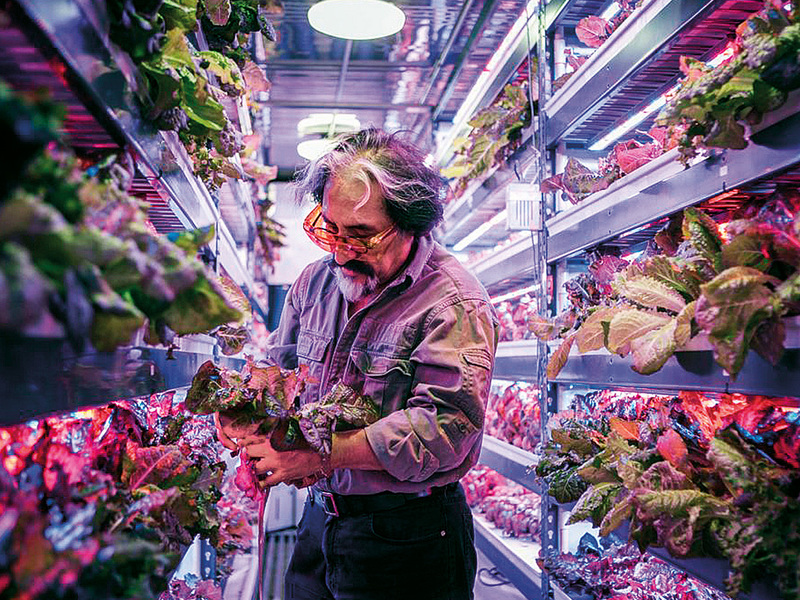 As the movement continues to evolve, some are experimenting with novel ways to make local agriculture an integral part of urban life. At this year’s World Future Energy Summit in Abu Dhabi, Maha Al Muhairi displayed her innovative energy-efficient automated system, FreshFridge, which lets you grow a wide range of herbs and microgreens in your kitchen. “The FreshFridge allows users to grow more than 50 varieties of microgreens in 10-15 days. People can grow whatever they want in any season,” says Al Muhairi. The FreshFridge allows users to grow more than 50 varieties of microgreens in 10-15 days. But growing crops sustainably isn’t always easy. “Steep costs of acquiring cutting-edge technologies and unavailability of raw materials locally for production are among the challenges,” says Omar. While according to Al Jundi, the concept of vertical farming is still in its infancy in the region. “Governments and the private sector need to invest heavily to accelerate learning and development in this sector,” he says. Although these new-age farming initiatives will not change the UAE’s reliance on food imports drastically, it certainly represents a better way of growing produce and a future of continually increasing food supplies in ever more sophisticated manipulation of agro-ecosystems.